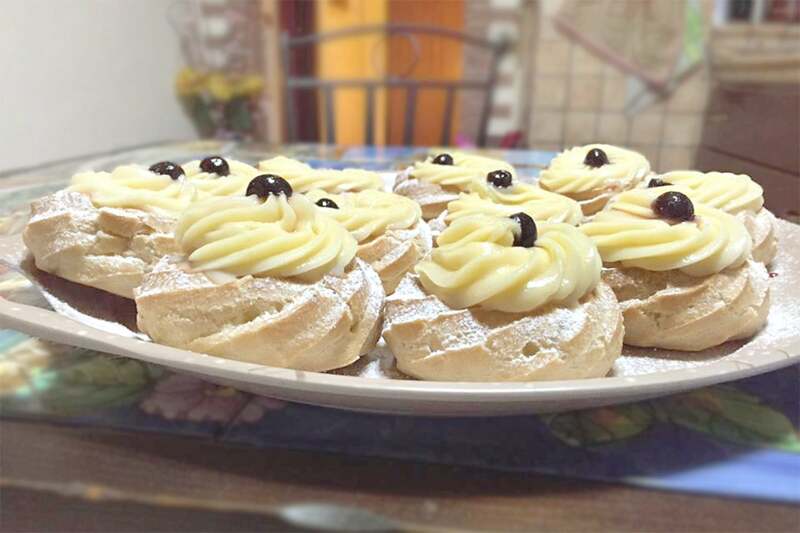 The “Zeppole of San Giuseppe” or the Italian cream puffs of Saint Joseph are a typical dessert of the Italian kitchen, and originate from an old tradition that dates back to the Roman times. According to tradition of the time, after the flight into Egypt with Mary and Jesus, St. Joseph had to sell pancakes in order to support his family in a foreign land. It is precisely for this reason that throughout Italy, the donuts are the typical sweets of Father’s Day, prepared to celebrate all Dads of the families as well as Saint Joseph. Enjoy our Italian Cream Puffs! Step 1 In a pot with a very thick bottom, add the water, milk, salt and the butter. Step 2 Melt over medium heat, bringing almost to a boil. Step 3 At this point, remove from the heat add all the flour, which will be put in all at once, otherwise it might create lumps: stir quickly. Step 4 Stir vigorously with a wooden spoon and place the mixture back on the flame, still stirring. Cook and stir the mixture on the stove until it comes away from the sides of the pan and forms a white-ish cream. Step 5 Remove from the flame and let cool a little. Step 6 Transfer the warm mixture in the bowl of a mixer with the leaf-shaped hook and let it mix for few seconds to lower the temperature. Step 8 you can easily do this by hand with the use of a wooden spoon and the strength of your arms. If you do use a mixer, with a spatula occasionally scrape the dough stuck at the bottoma dn the sides. Step 9 For The Pastry: Bake the donuts for 35 minutes in a static oven at 350 degrees. Stick a wooden spoon in the door so as to leave the door of the oven slightly open.